Guide to the Anthony Larme Computer Games Censorship Collection. To coincide with the August 24, 2001 announcement that the Office of Film and Literature Classification has officially begun its review of the Computer Games and Films Classification Guidelines, this Web site details a relevant measure the author, Anthony Larme, could take to assist in this process. In the interests of informing Australia's Federal politicians and public servants in order that they might make wise decisions regarding the censorship of computer games in this country, the author is pretending that he has donated a large portion of his extensive collection of computer games censorship resources to the Australian Parliamentary Library in Canberra. One of the main conditions of this arrangement was that he agreed to prepare this comprehensive Web site that contains a series of eBrief style resource guides/summaries of computer games censorship issues, each with pointers to the specific relevant resources of the collection. He was instructed to present both sides of the censorship argument as even-handedly as possible while always keeping in mind the Australian Library and Information Association's well known commitment to the ideal of "freedom to read". This entire process involved applying principles of information organisation and the critical evaluation of resources, both being skills acquired through the author's librarianship studies. This Web site has as its aim the provision of a much-needed summary of issues and an annotated, critical bibliography relevant to Australian computer games censorship. In doing so, it presents its subject matter in detail with the aim of establishing higher standards for online resource guides on specific topics in government and special libraries. The Games Censorship Collection site also hopes to have presented a guide to resources which will assist people to make more informed, and therefore more valid, decisions which will impact beneficially on the society they represent. 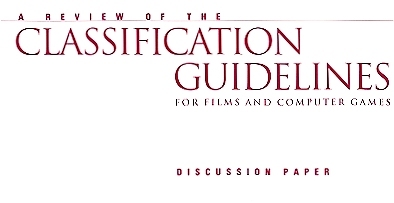 It has been five years since the Film Classification Guidelines have been formally reviewed. The Computer Games Classification Guidelines have never before been reviewed since their inception back in 1994. Although there were indications of a planned review of the Computer Games Classification Guidelines around the same time as the last Film Classification Guidelines review, the actual review has been repeatedly delayed. Since the last review of the Film Classification Guidelines, many research findings have become known and technological advances made that have rendered the current Guidelines for both media semi-obsolete. With revised Guidelines that intelligently, fairly, and accurately take the realities of modern entertainment media and their consumer demographics into account, Australia can ensure that its regulatory system for these products establishes a new benchmark for such guidelines worldwide. Any attempt, whether successful or not, made by any group or individual to restrict public access to computer games on the grounds that a lack of such regulation would lead to moral and/or psychological corruption among some or all sections of the population. Classification is considered a form of censorship under this definition. Please read both the press release and the new downloadable Guidelines to see if you believe that Australia now has a reasonable computer games censorship system!